"Although Brussels sprouts are often included in holiday menus, this fiber-rich vegetable deserves to be included in meals all winter long. Preparation Time: 20 minutes. This recipe is from The WEBB Cooks, articles and recipes by Robyn Webb, courtesy of the American Diabetes Association." Trim each sprout by cutting a little piece off the bottom. With a small paring knife, make an X in the top of the sprout. Repeat with all sprouts and place in steamer over 2 inches of boiling water. Steam the sprouts covered for about 10 minutes or until tender. Add the broth and pour over all ingredients. Drizzle the casserole with oil. Grind in pepper and salt. Bake for 15 minutes or until oranges are soft. To roast whole chestnuts: Mark an X on the rounded side of each chestnut with a pairing knife. Place all the chestnuts on a baking sheet, and roast in the oven for about 30 minutes or until soft. Let cool. Peel, trying to keep the chestnuts as whole as possible. Learn how to make tasty Brussels sprouts in a warm orange sauce. 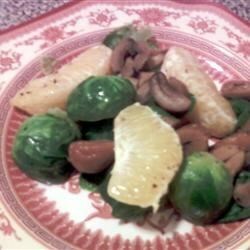 Sprouts and chestnuts are naturals together. Adding orange is a touch of genius. Delish recipe! I did not care for the taste. It may have been the quality of the orange I used. I do like the possibilty of an orange sauce and brussels. May give it a try with orange juice. I'm a big fan of brussels sprouts, so I'm always looking for different ways to prepare them. This was delicious! Now, if only I could get my husband to eat them! Love the recipe... last year I used the chestnuts... too much work. so this year I substituted pecans... and it was great. Lots of work with fresh chestnuts... but different and very good... everyone likes it at our holiday dinners!